Thanks Op. That's a great story about someone that I would love to have met. Do you mind listing your references? 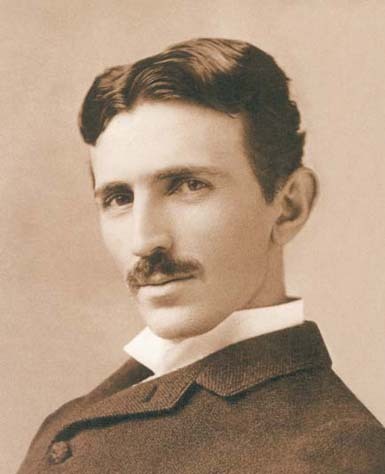 One of the more controversial topics involving Nikola Tesla is what became of many of his technical and scientific papers after he died in 1943. Just before his death at the height of World War II, he claimed that he had perfected his so-called "death beam." So it was natural that the FBI and other U.S. Government agencies would be interested in any scientific ideas involving weaponry. Some were concerned that Tesla's papers might fall into the hands of the Axis powers or the Soviets. The morning after the inventor's death, his nephew Sava Kosanovic´ hurried to his uncle's room at the Hotel New Yorker. He was an up-and-coming Yugoslav official with suspected connections to the communist party in his country. By the time he arrived, Tesla's body had already been removed, and Kosanovic´ suspected that someone had already gone through his uncle's effects. Technical papers were missing as well as a black notebook he knew Tesla kept—a notebook with several hundred pages, some of which were marked "Government." 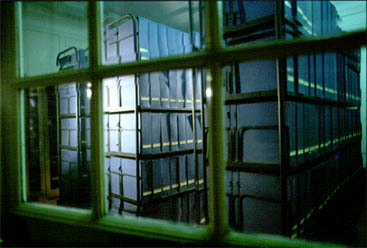 P. E. Foxworth, assistant director of the New York FBI office, was called in to investigate. According to Foxworth, the government was "vitally interested" in preserving Tesla's papers. Two days after Tesla's death, representatives of the Office of Alien Property went to his room at the New Yorker Hotel and seized all his possessions. 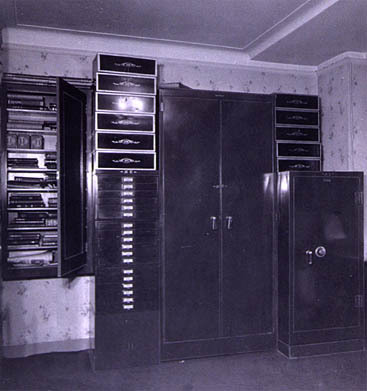 Tesla's suite at the hotel New Yorker following his funeral on January 12, 1943. 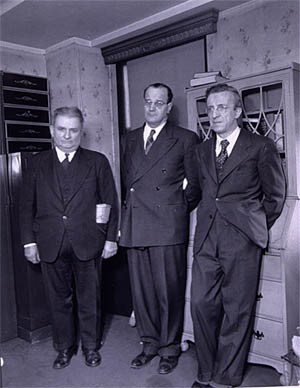 Left to right: Bogoljub Jevtic´, a member of the last Royal Government of the Kingdom of Yugoslavia; Professor Boris Furlan, a Slovene active during the war in the United States, who went back to Yugoslavia where he was arrested and liquidated brutally; Sava Kosanovic´, Tesla's nephew and member of the Royal Government in exile. The library archives at the Tesla Museum in Belgrade, Yugoslavia. Notice the last line on that page... "We have exceeded Tesla's results...."
Do you know if anyone has tried to follow on his work? cos it seem's to me he had something here. Also why haven't they just gone public and put it on the net? Oh wow has anyone tried building any of it? An awesome read about Tesla, George Scherf Jnr (AKA George W Bush Senior) and some interesting findings.